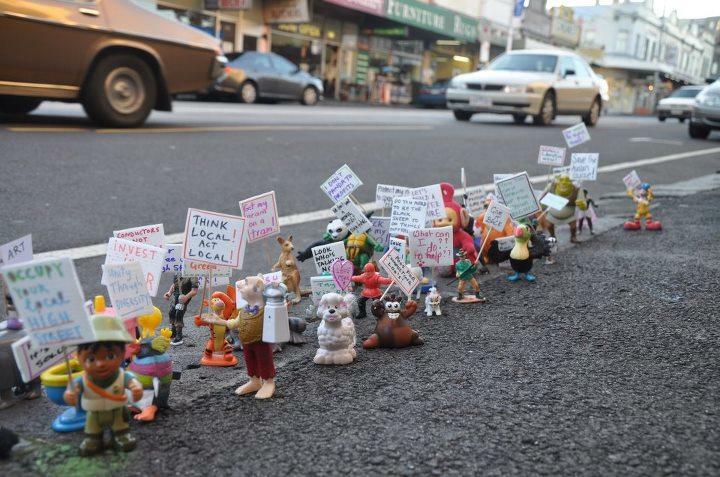 This week we’re giving a shout out to small-scale activism with the #occupysmallstreet movement. First inspired by a doll-sized action in Siberia, this example has been created by Arts X Activism from Melbourne, Australia. Signs are made collectively, by regular Occupy Small Street-ers and members of the public (adults and children) who stop by and have something to say. The idea has since been re-staged in London, Indonesia, Brisbane and Sydney. Simple to do and playful enough to draw people in – they’re diminutive in stature, but big on ideas.